Here are photos and a note submitted by our recent guests. A special thanks to Barbara and David Thompson for allowing us to be a part of their special occassion here at the Thistle Lodge Beachfront Restaurant. I wanted to thank the staff of The Thistle Lodge for making my 25th anniversary dinner special and helping me pull off a great surprise for my unexpecting wife. My wife Barb and I were looking for a special place to spend a week celebrating our 25th wedding anniversary. Although we have been to the Ft Meyers area before we have never had the pleasure to spend any time in the Sanibel / Captivia Island area. 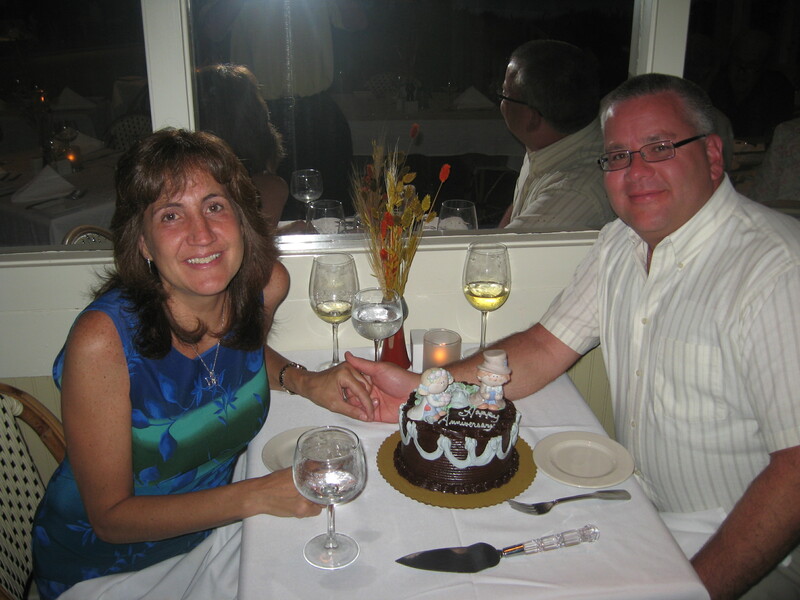 As soon as we choose Sanibel we starting asking friends and relatives who have visited the area what would be an elegant and romantic place we could enjoy our anniversary dinner. The Thistle lodge was recommended overwhelmingly by our friends and family, not only for the excellent menu and wine list but for the friendliness of the staff and traditional Island ambiance. I then made contact with the restaurant not only to make reservations but also ask if they could accommodate a special anniversary request. I spoke to Dennis and he was more then willing to assist me with a special request. Barb and I were married September 21, 1984. 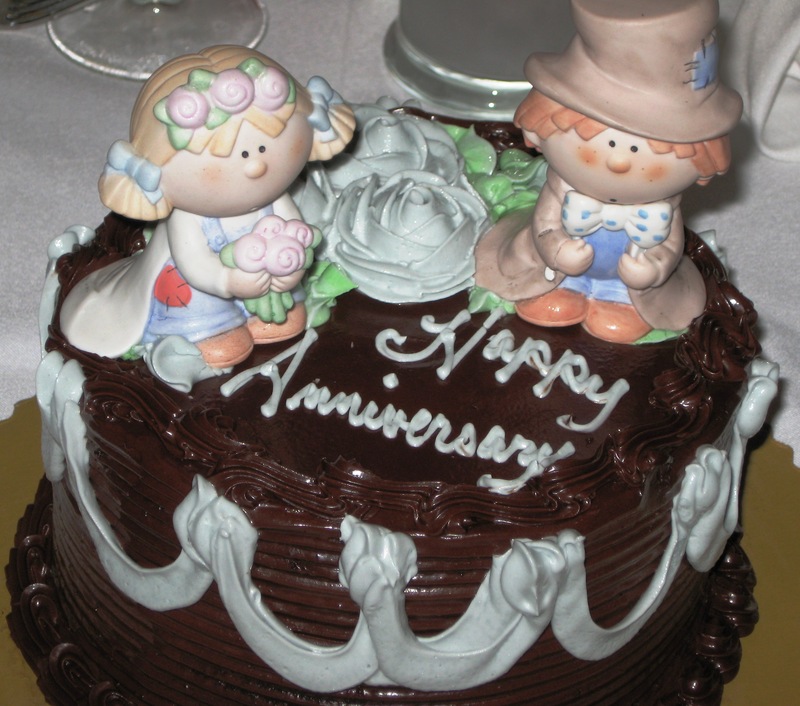 On the top of our wedding cake were two little ceramic Bride and Groom figurines called “Bumbkins”. Well raising two children and moves from apartments to a home they were broken over 20 years ago. Knowing our 25th anniversary was coming up I wanted to replace the figurines but found out they were no longer in production. After several weeks of searching the internet I managed to find them on eBay and was the successful bidder. Now I needed to get them to Sanibel for a surprise without my wife finding out. This is where the Thistle Lodge showed the hospitality and customer service that we had heard about. I received the figurines in Buffalo on Wednesday and that is when I spoke to Dennis. I arranged to air freight them down and the staff at Thistle Lodge handled the rest. They arranged to get me a beautiful decorated (and delicious) chocolate cake. Dennis called me on Friday to confirm “everything was a go”. They never let on at all that anything was up when we arrived, checked in and were seated at a lovely table for our candlelight dinner. After a couple glasses of wine, appetizers and a delicious meal our waiter came out with my chocolate cake and my precious Bumpkins on top. The surprise literally brought my wife to tears!! Thank you Thistle Lodge Staff for making my 25th very special. We plan on celebrating with you again soon and again on our 50th September 21, 2034! Categories: Casa Ybel Resort, Special Event, Thistle Lodge | Tags: Anniversary, Special Occassion, Thistle Lodge Beachfront Restaurant | Permalink.